My nine year old has a Summer Bucket List, a Summer Bucket List with about 20 more items he would like to get done…before Summer Vacation ends (in 16 days!) So we got out the list and one of the items was decorate & bake cookies. Easy! We decided to make it even more exciting by making our own cookie cutters. Now these cookie cutters will not last forever, but if you hand wash them, and store them carefully you can use them more then once. 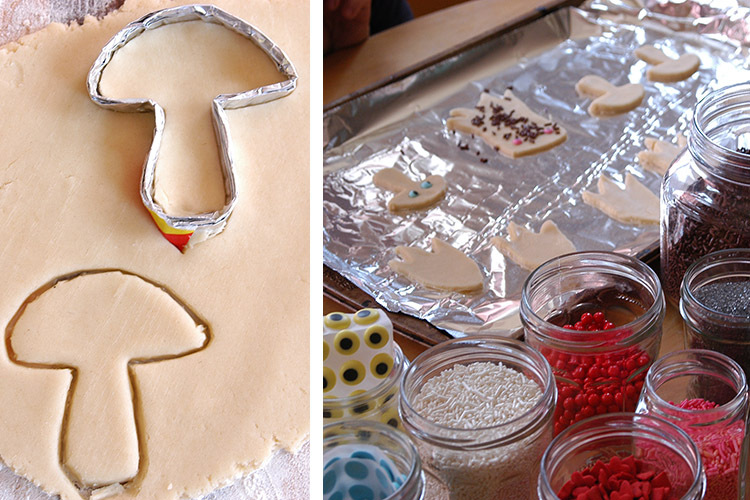 If you want a forever cookie cutter you’ll have to take a trip to the hardware store…but if you want a cookie cutter you can make and use right now with items you probably already have in your house, then this DIY is for you! 1. Draw a design that you would like to make into a cookie. Remember that small thin areas will be harder and simple designs work best. We made a tree stump, mushroom, and ghost. 3. fold you foil in half length wise, then you are going to fold it in half 3 more times till you end up with a long skinny strip. This time fold it in half height wise and you’ll end up with a thick 12 inch strip. 4. Now for your last fold, you will fold this 12 inch strip in half length wise (just like at the beginning). I like to use the edge of my scissors to get a good clean smooth line. This will be your final strip for shaping your cookie cutter and will feel easy enough to shape using your hands, but sturdy! 5. Using your drawing as a guide gently bend and shape your cookie cutter into shape. Just take your time and lay it down on the drawing to check as you go. Once you get to the ends you only want a small overlap. Trim off any extra strip with your scissors, and then staple the ends in place slightly overlapping. I like to make sure to staple so the end prongs of the staple are facing the outside of the cutter. 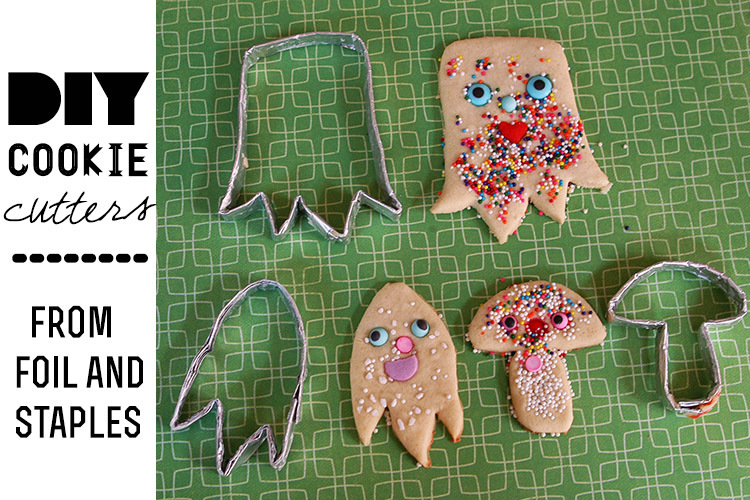 Now you are ready to use your cookie cutters! 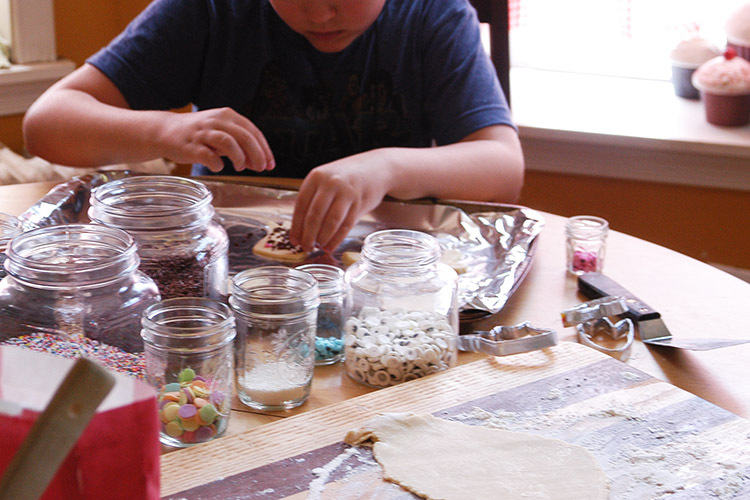 This is our most favorite sugar cookie recipe to use. It is vegan but you could use eggs & regular cream cheese if you didn’t have those vegan supplies. The dough turns out so perfectly, and we use it right away without any chilling. Just a little flour and its never too sticky. I also like that this recipe really holds its shape, and is not too sweet. This means they are great for a ton of sugar or frosting on top, without tasting sickeningly sweet! 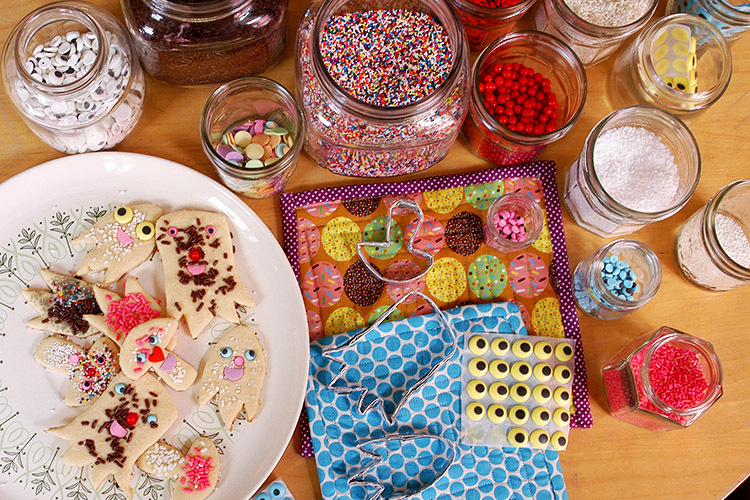 And decorating the tops of our cookies with sprinkles, and eye balls, and sugar crystals is really the best part, so we don’t like to skimp. You can see our finished plate full of cookies over on instagram! Excellent!!! Great idea. Those cookies look so good. !!! I can’t wait to try this! I love the eyes! I remember as a kid getting them on my ice cream at a tiny little ice cream shop. 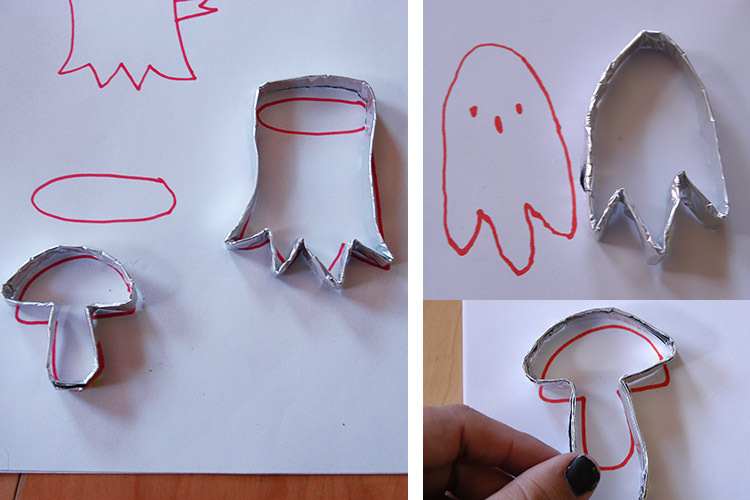 I make my own cookie cutters by cutting a wide ring from a soda can, then bending it in the desired shape. You can do this with household shears. Snip the ring in a couple places along one edge, then make about a 1/4-inch folded edge to give strength to the cutter. You can make big cookie cutters out of big cans, too, but you will need some gloves and tin snips. I love the little eyeballs that you used on the ghost! I’m assuming that they are edible. Where did you find them at? Wish I had seen the foil method before! We made hand shaped cutters for Halloween (to form burger patties) . The best tip I found was to buy large cookie cutters, cut them open, and re-shape them. It worked pretty well! MissNye, thats a great idea! Is the one edge sharp for kids? or is it pretty dull…I love this idea! oh what a cool idea! i can’t believe i’ve never thought of that! awwww. such a good idea! i love the lil’ mushroom!